WHAT? Another nail art story on BeautyRiot.com? Shocking. So, when Fashion Week rolled around, we were not only super psyched about the clothes, hair, and makeup, but we couldn’t wait for the nail art to hit the runway. 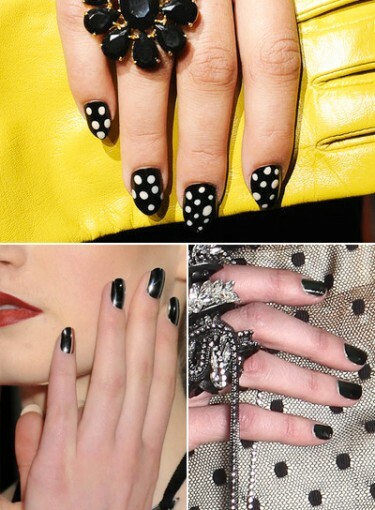 Click here for the best nail art from fashion week. And this year didn’t disappoint. We saw fresh takes on old classics, like the French manicure and the half-moon design. We also checked out crazy, OMG WTF looks, like CND’s crushed glass creation. (That one was a little dangerous, not gonna lie.) And we also got the leg-up on all the new trends, like shiny, metallic, high-tech nails. You should feel jealous by now. Luckily, we’re a sharing bunch, and we took tons of nail photos, got those much-needed how-tos, and pumped the pros for their top tips. The best part: many of these looks only require two different polish colors, and a few nail art tools. It’s that easy. Needless to say, we’ve already given these designs a go; now it’s your turn. Keep flipping to check out the best nail art from fashion week.